This has been one of our fastest selling books ever and rightly so. 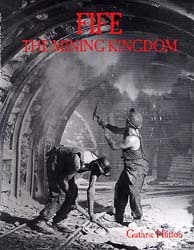 It is the definitive work on the history of mining in the Kingdom (the Kingdom of Fife that is) and is a treasure of poignant photographs from pits and communities in all the mining areas of the county. Included are Longannet, Bowhill, Valleyfield, Comrie, Fordell, Blairenbathie, Lumphinnans, the Nelly, Glencraig, Dundonald, Lochore, Kinglassie, Star, Rothes, Seafield, the Michael, Wellesley and more. The coverage is geographically comprehensive and all the varied aspects of life in a mining community are represented; housing, pit bands, rescue teams, quoiting and of course, football.